There will also be a Children’s Fun Park – Merry Go Round, Trampoline & Castle, a Food Court – Lynette Creole Kitchen and Beverage Bars – Banks DIH, Ansa McAl, DDL, Heineken. 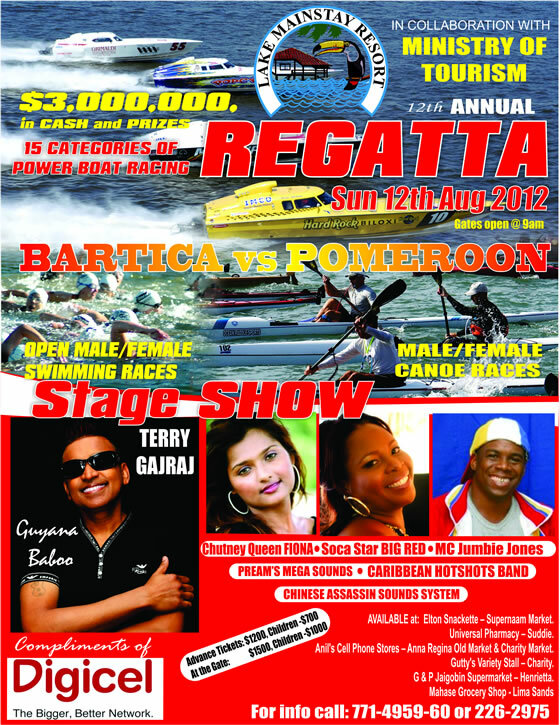 Lake Mainstay Resort Regattas have grown over the years and gained the reputation to be well organized, disciplined and the biggest in Guyana over the past two years. We are promoting a family event and anticipate in excess of 8,000 patrons from overseas and locals from across the country, especially the Essequibo Coast, Region 2. This event will be massive and entertaining. Management advises all attending to be early to secure a vantage spot to enjoy the many racing events all day long.